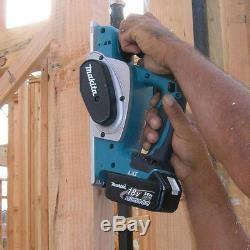 Makita XPK01Z 18-Volt 3-1/4-Inch Lithium Ion Wood Planer Plane, (Bare-Tool). 2-blade cutter head with double edge carbide blades for added performance and smooth finish. High power-to-weight ratio; weighs only 7.4 lbs. 14,000 RPM motor engineered for fast stock removal. Spring-loaded stand elevates the base to protect the blades and workpiece. Precision machined aluminum base for planing accuracy. Ergonomically centered balance with rubberized soft grips on the front and rear handles for increased comfort on the job. Easy blade setting system for fast blade installation. Electric brake for maximum productivity. Equipped with Star Protection Computer Controls to protect against overloading, over-discharging and over-heating. Rapid Optimum Charger communicates with the battery's built-in chip throughout the charging process to optimize battery life by actively controlling current, voltage and temperature. Rapid Optimum Charger has a built-in fan to cool the battery for faster, more efficient charging. Makita technology delivers category-leading charge time, so the battery spends more time working and less time sitting on the charger. Compatible with Makita 18V Lithium-Ion batteries with a Star symbol. What's in The Box. 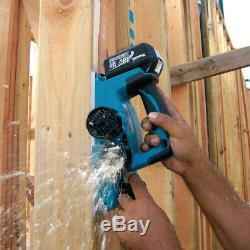 18V LXT Lithium-Ion Cordless 3-1/4 Planer. SECURE & HASSLE FREE SHOPPING. All our sales are backed by a 30-Day Satisfaction Guarantee. Products shown as available are normally stocked but inventory levels cannot be guaranteed. 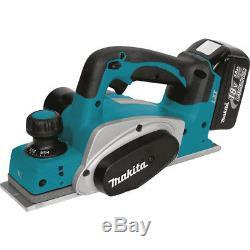 The item "Makita XPK01Z 18-Volt 3-1/4-Inch Lithium Ion Wood Planer Plane, (Bare-Tool)" is in sale since Tuesday, August 29, 2017. This item is in the category "Home & Garden\Tools & Workshop Equipment\Power Tools\Planers". The seller is "factory_authorized_outlet" and is located in Ontario, California.